This is my only sketch from an entire 3 day weekend! But I have a great excuse! 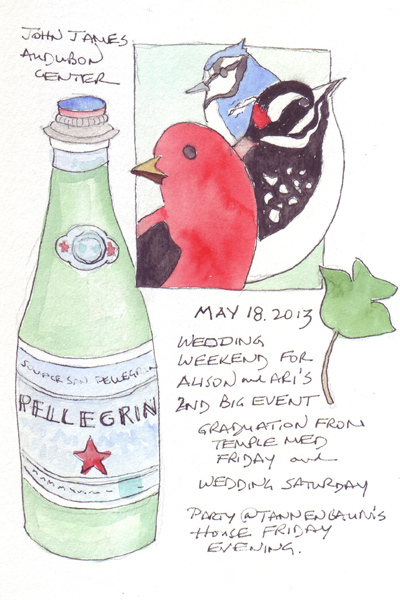 Our Family went to Philadelphia this past weekend for a very special wedding. Even though the groom is the grandson of my husband's first cousin, they are the family who we spend major holidays with, including all Thanksgivings since 1989! The wedding couple both graduated from medical school on Friday afternoon and that evening was the start of a weekend full of celebratory activities. Ari will begin his internship in Internal Medicine at the University of Chicago next month - the program that I trained at beginning in 1969! Our children were there and we took advantage of the occasion to get a family photo. 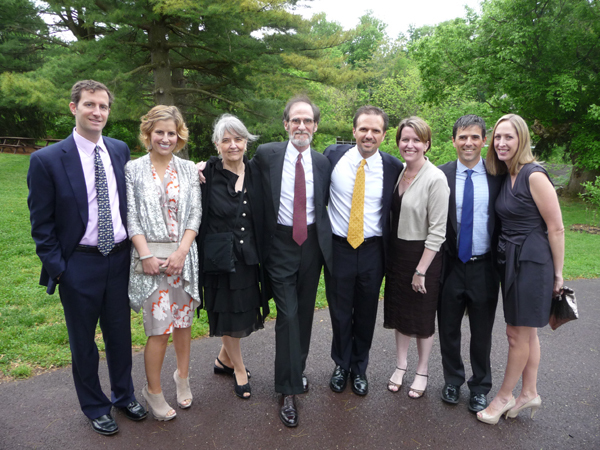 It is rare to have everyone together without our grandchildren, and dressed up. 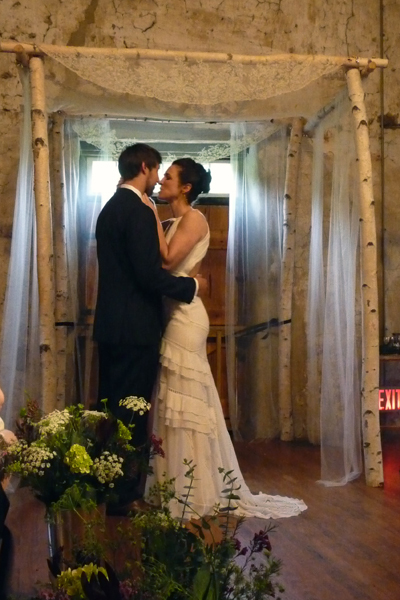 They are very close to the groom and his older brother - and we adore both of their wives. And, both families were thrilled - making it a joyous event. Only one of our grandchildren was there, and my husband and I took care of him Saturday AM. Since they live in DC, this was a fabulous babysitting gig for us! 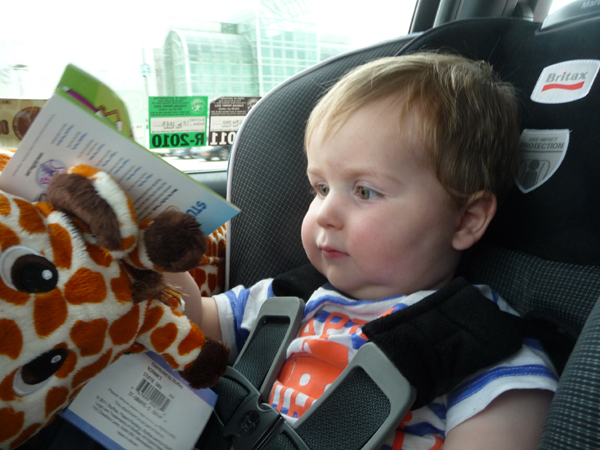 Here is William gazing at his giant new giraffe. 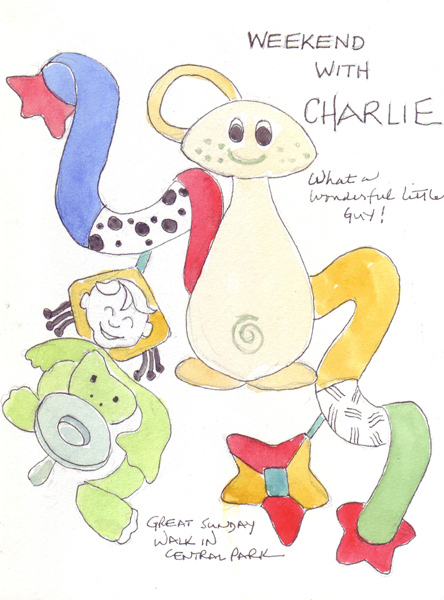 I finished painting the sketchbook page I did in honor of Charlie's 3 day visit. More details are in the previous blog post. Today I walked to 3 galleries to see their current exhibits and quickly sketched a few details from one of Paul Klee's Bauhaus prints. The lady in profile captured my attention as soon as I saw the print and I had to return to sketch her quickly with my dreaded Pentel Pocket Brush Pen! The print was from 1925 and it was in one of 3 exhibits that I really enjoyed. George Grosz (Watercolor Paintings) at Soufer Gallery. 1015 Madison Ave from April 23- June 14, 2013. One of my favorite Spring and Fall Art Events is the Impressionist and Modern Art Auctions at Christie's and Sotheby's in New York City. As was written in the New York Times last Friday, "Before the Gavel Falls, It's All Free to Look At." 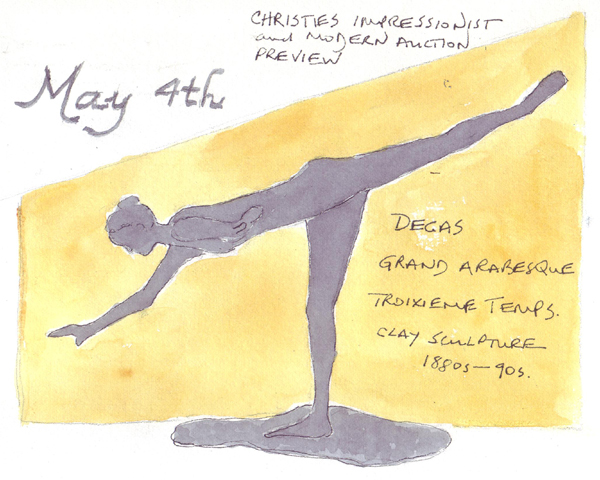 The paintings, drawings and sculptures that are being offered for sale at these auctions. are usually going from one private owner to another - meaning that most are infrequently seen by the public. My husband and I loved the preview at Christies, and they have wonderful audio descriptions of 8 major works on their website at this link. I love ballet, ballet classes, and Degas for his many paintings, drawings, and sculptures of ballet dancers. This one is beautiful - much more sophisticated in its rendering than many in the collection of bronzes at the Metropolitan Museum of Art. I stood quietly, off-to-the-side, and sketched her, enjoying my brief minutes with her beauty. The sculpture is 16" high and 21 5/8 inches long. The estimated sale price is $600,000-800,000. I will be able to look at the final sale price after the auction, but no information about her new home will be available. 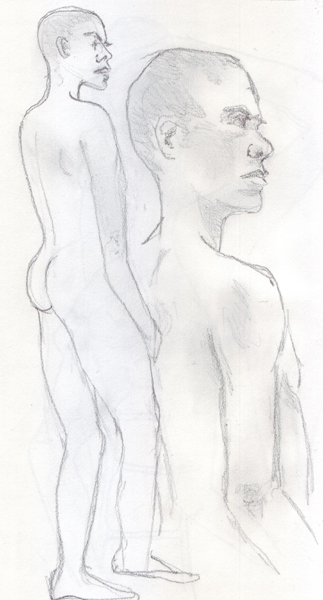 I made it to figure drawing again in April - and really enjoyed the jazz, the glass of wine and one of the models. The other one not so much. Here are a few of my drawings from the evening. The male model is really tall and skinny and he extends his arms, legs, and fingers (which must be 12 inches long) in every short pose. 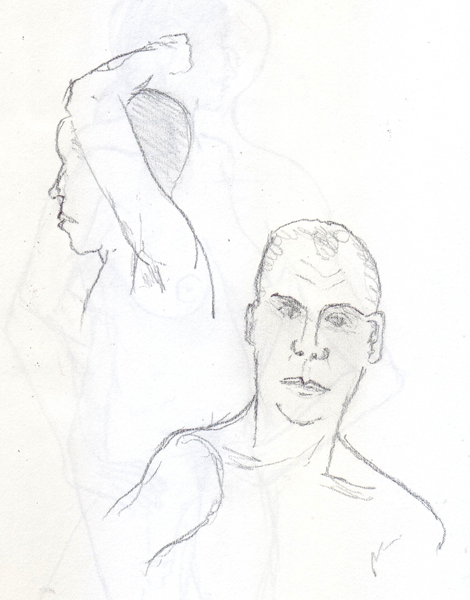 These are therefore incredibly challenging and I find I have to focus on a smaller part of him to get anything drawn during these 2 minute warm-ups. And Finally a 20 minute Pose by Him. I couldn't capture the way he had his legs crossed over each other, he was bearing weight equally between his legs and had both knees slightly bent. Yikes! So I moved on and did a slightly different half-body view of him for the remaining minutes. Several weeks ago I asked for ideas for my daily sketches because I was bored with the possibilities during the last days of winter. 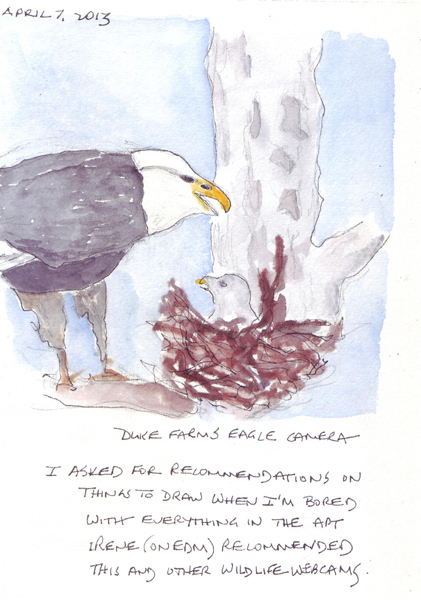 Irene Brady suggested looking at animal webcams and sent me the link for an eagle nest. While watching it, I snapped a phpto and then sketched one of the parents feeding a baby. Thanks Irene. 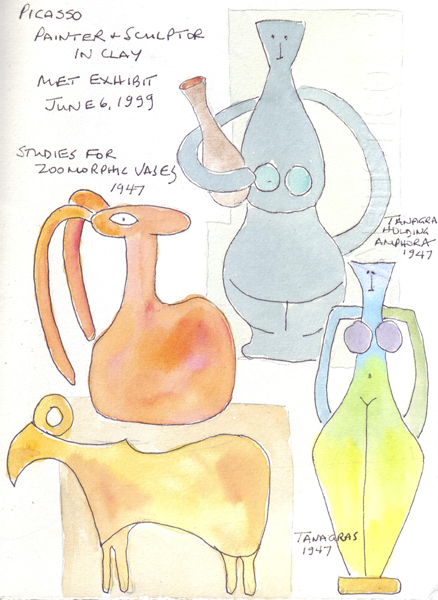 I also went back to my first sketchbook (started in 1998), and looked at a few of my early sketches. Everything was sketched in pen and no watercolor paint was added until almost the end of sketchbook 3 (2008). 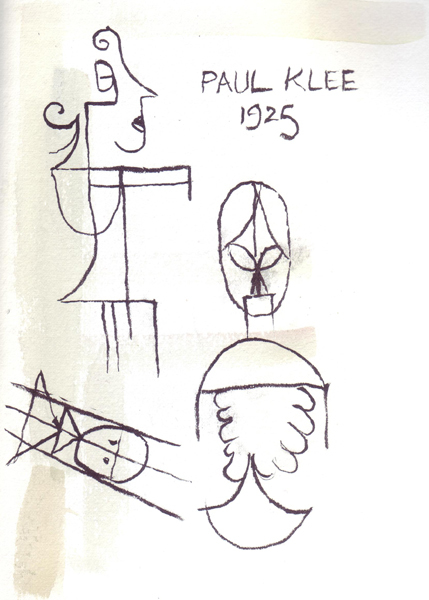 In 1998 I sketched many Picasso ceramics at an exhibit at the Metropolitan Museum of Art - all in black pen. I loved the shapes and decided to redraw them and paint them wet-in-wet with watercolor. 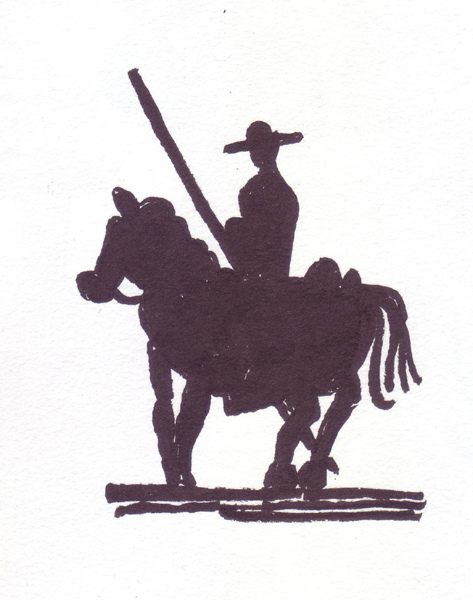 I also challenged myself to draw the Don Quixote image from one of the Picasso plates with my "hated" Pentel Pocket Brush Pen.